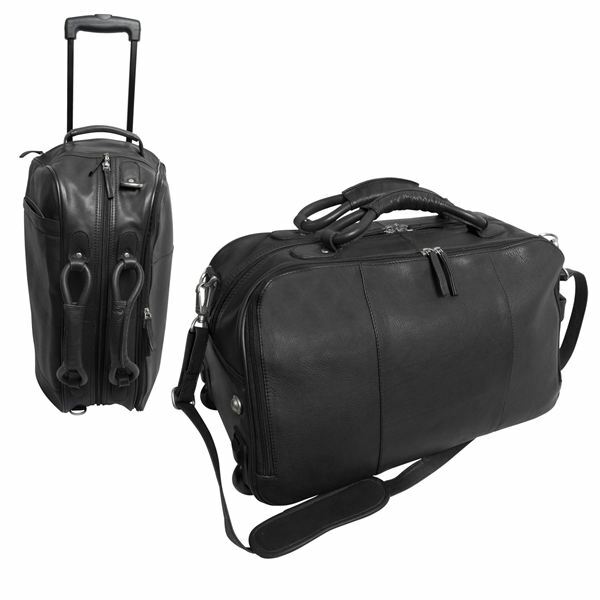 This classic, traditional, all-leather Wildcat Canyon legal carry-on rolling duffel is so easy to transport with its two in-line skate wheels and a telescoping handle! The handle position extends to 11" or 22". The large main compartment has an inside pocket for small items and a large outside pocket. The 11" x 11" x 22" bag has polydrill lining. The ergonomic detachable comfort shoulder strap adjusts from 36" to 50" for the perfect carrying length or the bag can be carried with the padded soft handles. It comes with a matching luggage tag for quick identification. What more could clients want in a useful promotional gift? Size: 11.00 " x 11.00 " x 20.00 "